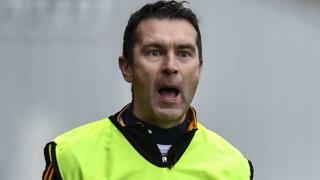 Crossmaglen joint-manager Oisin McConville salutes his squad after the 2-17 to 2-12 win over Scotstown in the Ulster Club Championship final. The Armagh champions sealed the victory in extra-time after a tremendous battle against the Monaghan title holders at the Athletic Grounds. It was a record 11th provincial crown for Crossmaglen, McConville starring as a player in the previous 10.